Academic exclusion is basically when you are forced to drop out of university because you have not done well academically, meaning you have failed to pass enough courses to meet the minimum credit requirements that will enable you to register in the following year. The minimum credits required for you to continue each year are usually written in that thick faculty handbook that most of us do not bother to read until it is too late. Each faculty usually has different requirements for re-registration for the next year so it’s wise to check with your faculty what the requirements are, for example at The University of Cape Town for an undergraduate humanities student to be excluded they would have to pass less than 3 semester courses which means if they pass 3 or more semester courses in first year they would not get excluded, for a commerce student they have to pass half the semester courses they are registered in for the year to not get excluded that means say out of 8 semester courses in first year of university they only need to pass 4 courses to not get excluded, and for an engineering student to not get excluded they would have to get 80 credits from their first year courses. Also note that different rules apply for people in extended programmes, so it’s important to know the rules specific to your programme. Also note that it is possible to get excluded after first year as there are a minimum number of credits you are required to pass in every academic year. 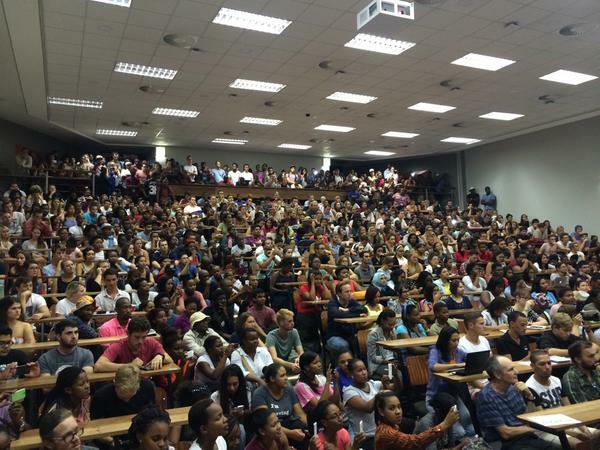 Why students get academically excluded from South African universities? Firstly I would like to say that the transition from high school to university is no easy and smooth transition. It’s like going from playing soccer in the street or the local playground with your friends to playing soccer in the premier league. At the lower levels you thought you had the skills, you dribbled easily past your opponents and scored lots of goals but then you got to the premier league and you couldn’t keep up, you could barely last 90 minutes and you couldn’t score because the defenders were better, the keepers were better and the game was played at a faster pace. You either have to adapt to the faster pace and better opponents or you will end up getting benched, lose whatever form you had and your career will be over after that. 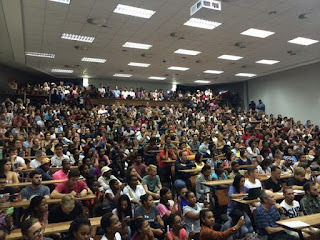 For South African students going from high school straight into university is a drastic change like going from playing in a local playground with your friends to playing in the premier league, it’s like we skip a few stages which would have better prepared us for handling the fast pace of university and the increased workload. South African educated students struggle adjusting in first year because as I said there is a major shift in what’s expected for one to make it in university compared to what we had to do in order to get good marks in high school. A once straight A student will find themselves struggling to get 50’s in university and wonder why that is as they are doing what they used to do in high school. Only a few will adjust and be able to cope with the workload, those elite few make it into the deans merit list, the rest of us are happy to just be passing and over the moon if we are getting 60’s because that is doing well at university. Then there are those who never get a hang of things at university, they don’t get DP (duly performed is what you get when you attend enough tuts and get the minimum class record to be allowed to write an exam for a course) or they struggle to get DP. Then at the end of a semester they have failed some of their exams and did not even write other exams because they didn’t get DP and all of a sudden that student is in trouble, they are in danger of being excluded if they don’t get the minimum number of credits required at the end of that academic year. In some universities students can be excluded as early as after the first semester. The problem is we always think we have time to improve, the first test is a wakeup call, and we think we can do better in test 2 but then test 2 is harder than test 1 and bam! It hits you, you don’t get DP. Sometimes you don’t work hard enough during the semester and you just make DP and you are happy but for some reason you think you will have time to study for the exam and do better than you were doing during the term but that doesn’t happen and you fail the exam. It is always better to work hard during the semester and get a high class record or at least a class record above 50% so that when the exams comes all you need to pass is a 50% or even less if your class record is above 50%. When you just aim for DP you end up having to work harder than you’ve worked all semester to get a mark you haven’t managed to get yet during the semester. Some manage to do it and pull a rabbit out of the hat but the truth is most students won’t be able to manage a pass for a course when they were doing really badly during the semester because what’s required in order to pass is a mark greater than 50% e.g. if you have a class record of 35% and your class record counts 40% of your final mark out of 100%, meaning your exam counts 60%, you would have to get 60% in your exam in order to get a pass which is 50%. Now 60% may not sound like such a high mark to aim for but it’s difficult for a person who only managed an average of 35% in their tests to all of a sudden manage a 60% in that course especially when they have other exams to study for and the exams are a few days apart. Another thing that contributes to students struggling with adjusting to academics at university, is what I call their newly acquired freedom. Most students have never been away from home, or they were in boarding school but they always had parents and teachers who looked after them and made sure they didn’t get into trouble and checked their progress regularly. When students go to university, most move away from home sometimes to a different province into res or off campus accommodation. The first thing they experience at res and on campus is orientation week were they meet other students from all over the world, from all walks of life and it’s basically a 2 week party before lectures begin (at UCT). For some, this party does not stop during o-week it continues on during the semester as they discover the local clubs in the city. If the students do not figure out how to balance fun and school work, their academics may be affected and eventually lead to academic exclusion. At university your lecturers are not like your teachers, your classes are packed with many students so you are responsible for yourself. No one will force you to attend classes, you bunk classes at your own risk, and you will not get reported to your parents because no one cares. You are treated as an adult in university, you have to take responsibility for all your decisions, if you start bunking classes and get left behind in your understanding of course content, you may end up failing your tests and eventually your course if you don’t wake up in time. The thing with students is that we think we can always catch up, we think we have time until it’s too late. Partying too much, can be one of the things that leads to students bunking classes because they have a hangover from the previous night. There are many other things that could make a student start missing classes, such as having a part-time job to pay for school or rent, pure laziness etc. South Africa is a very diverse country, we have students coming from different socio-economic backgrounds all coming to the same university doing the same courses. Some students come to university already at a disadvantage, for example they came from poor rural schools and their grasp of English is not adequate for them to properly understand university course work, so they not only have to struggle with studying at a harder level but they have to do it in a language they do not fully understand taught by people who cannot give them the individual attention they need (individual attention they got in high school from teachers who could explain the concepts in their home language). These students have a steeper mountain to climb, and it’s often these students from disadvantaged backgrounds who will get excluded. They will struggle following during lecturers, they will not do well in tests which would lead to not getting DP or getting to the exam but failing not because they are stupid but because they are at a disadvantage from the start and did not have the right support from the start. Don’t get me wrong universities do try and support students through giving students mentors at the beginning of the year and having talks about academics throughout the year but that is still not enough. I once read an article on this topic and I think it was a quote from an excluded student, the student suggested that if universities put as much energy in helping/informing at risk students before it’s too late as they did in notifying us how much we owe the university then the situation would improve. Information on where students can go to get help should be easily accessible, ways to avoid academic exclusion should also be known by all students. It should be a priority if we want the drop-out rates to decrease and the number of university graduates in South Africa to increase. This was part 1 in a series about academic exclusion from South African universities, we will be posting follow up articles soon so please subscribe to this blog via email and add us on google plus to get updates. Also please like and share this post so that others in matric or current university students can read it.